If you're using a notebook computer, the audio quality will probably be poor and not loud enough. To remedy this, you need external loudspeakers to improve the tone and volume, and provide a better spacial stereo effect if you're watching a movie. The Cherry Heaven USB Loudspeakers don't need batteries, installing, or setting up: they're powered by the computer's USB socket and driven by the stereo-out socket. 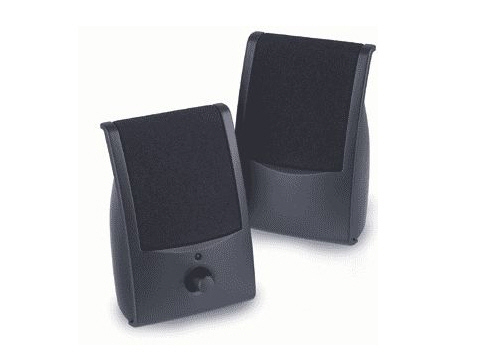 However, the photo is of a typical pair of speakers and the ones in stock might not look quite the same. External loudspeakers will improve your enjoyment of the BBC iPlayer, on-line movies, youtube videos, home entertainment, demonstrations, presentations, games, language learning, internet chat, and computer telephony applications such as Skype. The music on this page is Franz Liszt's Etude No 3 in Eb. To look at the pop-up photo, hold your mouse over the zoom button below: you don't need to click. Cherry Heaven USB Loudspeakers: Technical Specifications. The Cherry Heaven USB Stereo Loudspeakers are dark grey with black cloth. They measure 82mm x 82mm x 127mm high. The USB power cable is 1.8m, the audio cable is 1.8m, and the left-to-right connecting audio cable is 1.4m. One speaker has an on-off rotary volume control and a blue power-on LED. They're rated at 1W RMS per channel, and have a frequency response of 160Hz - 18kHz, a signal-to-noise ratio better than 60dB, crosstalk better than 50dB, a sensitivity of 300mV, and an impedance of 10k. They're CE marked, confirming that their electromagnetic radiation will not adversely affect wireless communication, and normal external electromagnetic radiation will not adversely affect their performance. This shop is shared with other Cherry Heaven resources. To buy on line now, use the shop link below the menu bar near the top of the page.